Identify the main issues they are concerned about or want more information related to cannabis legalization. This What We Heard: Cannabis Legalization report has been created. Along with other public engagement activities, the results of this survey will inform the City's approach to cannabis legalization and provide information to City Council as they make decisions related to regulating cannabis in Edmonton. 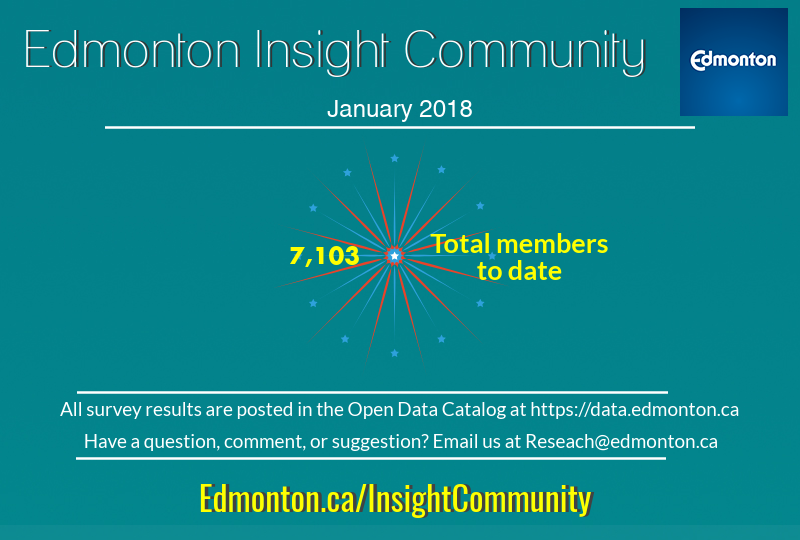 ​Each month results of the Mixed Topic Surveys are shared on the City of Edmonton's Open Data Portal (https://data.edmonton.ca/). No open comments are available as they may be personally identifiable. To view, simply choose the 'catalogue' tile and use the search (for example, June 2017 Mixed Topic) or navigate through to find the latest mixed topic results. There is a 45 day lag time from the end of the survey period to when it is uploaded to the Open Data catalogue. In addition to the Edmonton Insight Community surveys, the City of Edmonton uses a range of survey tools and approaches to gather input from Edmontonians. For those of you who want to share the Mixed Topic or any other survey we are running, simply send others to Edmonton.ca/Surveys and choose the survey to complete. We'd love to hear from them. Check the Public Engagement Calendar for various public engagement events happening around the city.